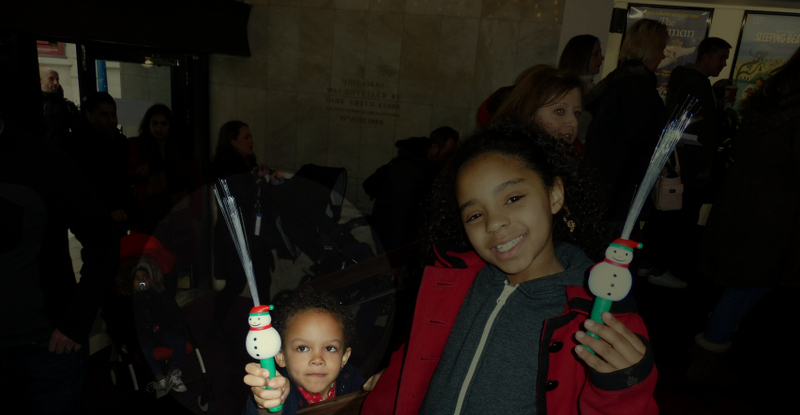 We saw The Snowman at The Peacock Theatre, Portugal Street, Holborn WC2A 2HT on Saturday 28th November. I haven't done any Christmas shopping yet and am yet to put the decorations up, so decided that this event would officially mark the start of our Christmas and it did not disappoint. Daddy accompanied us to the theatre, and I sent him off to get me coffee and a pastry as in the rush to get there, I'd forgotten my habit of needing two breakfasts in the 3rd trimester. Ordinarily I have a huge bowl of porridge straight after the school run, and toast before it. As it was, I discovered that the bar downstairs is open AN HOUR before the show, so that is worth bearing in mind. It's only now with hindsight I see that it is clearly printed on the tickets, as above; silly me! Doh! From the very second the show started and even before due to the stunning set design, the kids (Aaron and his two cousins) were captivated. Aaron was sat a couple of seats away from me, and I kept looking over to see his reactions - he was totally hooked. 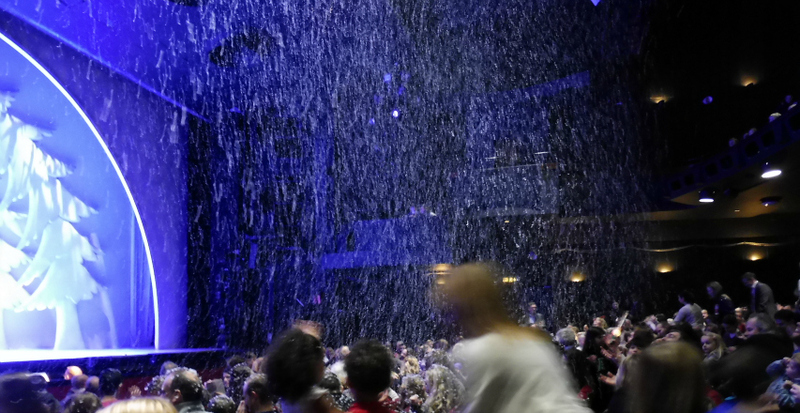 Before the show even begun, there were lights, either side of the stage, to mimic snow, which really set the scene. The video I just linked to, has a narrator, but if I remember rightly I don't think there is one in the show. Which makes you concentrate more actually, as you want to follow every bit of the show visually. It means EVERY movement the actor's make (as there is no script) garners more of your attention, which is great for keeping kids hooked and in their seats. I prefer that kind of beautiful focused concentration to the sort that Panto brings about. The show starts with a little boy waking in bed. Being the mum to a little boy of a similar age, that grabbed my attention. What struck me was how high up he is as the set design includes a two-storey house. Aaron adores snow and hasn't seen any in a few years (and doesn't remember the last time he did actually play in the snow) so he was sharing the boy's excitement and awe at seeing snow out his bedroom window. Everything in this show is so tenderly portrayed, even simple things like the boy getting dressed and the Mum's relationship with him. Him being unsteady on his feet as he puts his legs into trousers is very realistic and cute, as is him having breakfast in front of the TV, whilst Mum puts socks and shoes on, exactly as I do myself. It seems to be a1930s/1950s type of house with the Mum wearing a pinny and the Dad being a pipe smoking quite hands-off kind of parent. Yet the book was written in 1978. Just like the show, it was "wordless" - a picture book. The Snowman is a children's picture book without words by English author Raymond Briggs, first published in 1978 by Hamish Hamilton in the U.K.
Once the boy has his boots on and is outside, Aaron was tickled pink by the choreographed way he stomps around the stage. It was a joy to watch my son's reactions and how his eyes lit up. We did have a particularly great boy in the actor for our show: Oscar Couchman. From reviews I have read I think we were treated to a particularly excellent performance. He is 11 years old in real life but whether you are 5 (as is my Aaron) or 7 or 9, you'd easily believe that he is you, as he takes on an ageless innocent quality that is truly captivating. Utterly fabulous dancing and acting, conveying every emotion and mood that makes the show draw you in from start to finish. 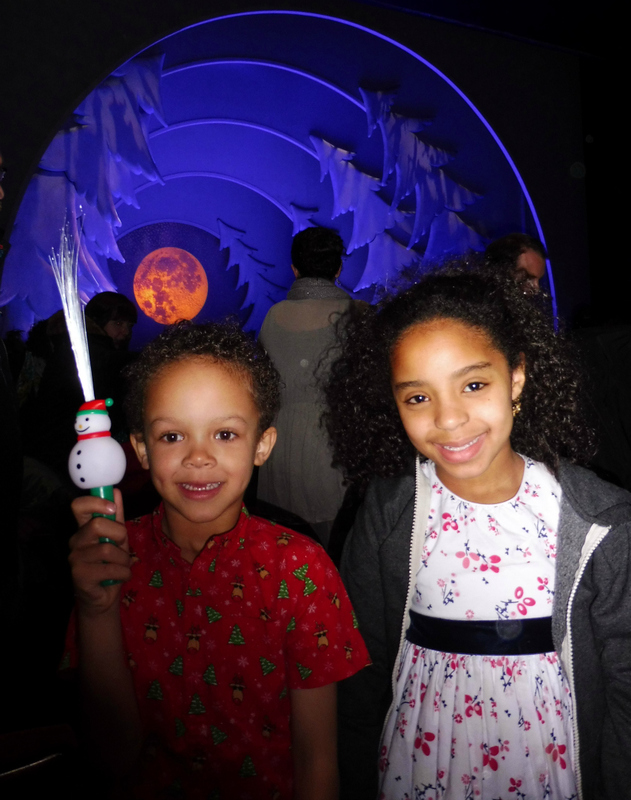 A highlight of those opening scenes was the boy making a snowball, which grew and grew as he rolled it across the stage. It appeared to be made of the same magical velvet cotton wool that the snowman himself was made of. Seeing Aaron's eyes grow WIDE as the snowball magically GREW made my day to be honest. The snowball is important as it BECOMES The Snowman. There is a Christmas carolling choir on hand who witness the building of the Snowman, and you feel as if their musical ability is going to contribute to the magic that brings the Snowman to life. They leave the boy with a naked Snowman and we get to witness the tenderness with which he dresses him, which is so touching, as he gives him buttons, a face and a hat. It really is evocative of the old days as the eyes and buttons are literally coal, taken from the coal bucket. A tangerine for a nose and a scarf finishes him off, just before the boy adds a smile which just makes your heart melt. The Mum comes to get the boy, briefly shares excitement at his tall Snowman, and they go inside to a beautiful warm fire, with the Snowman still being an inanimate object. But this is the point in time at which the magical carol singers return, as in the pic above. So good are the carol singers, the family (all 3) even come outside again to enjoy them. After paying the carol singers, the Dad is active for the first time in looking at his watch and declaring it bedtime. But this traditional house sees Mum going up the stairs for the run around that is a difficult bedtime. The couple do make a dance of getting his boots off just before that though. The dancing, jumping, running and joy that preceded bedtime, despite PJs being on, totally reminded me of our house. Aaron always finds excuses to go down and see Daddy one last time, which normally turns into 3 trips downstairs. I just have to start bedtime early enough to wrap up these hijinks so the show did make me laugh inwardly as it's certainly true to life for us. In the middle of the night, the boy gets up. I adore the illuminated clock behind him but it simply goes round and round and round. I'd love it if it showed approximately what time the boy gets up, as they manage to do A LOT during the night, but perhaps part of the magic is that time stands still whilst they play. The Snowman comes alive when the boy goes outside, as if the twilight hours (and the earlier carol singers) have spun a spell over him. The boy takes him inside. Unfortunately I don't have a photo, but the cat and the feline way in which she dances, when the boy and The Snowman go into the sitting room is truly joyful. Her movements are great for adults and children alike to be captivated by. She even does realistic cat like things like jumping on top of the telly. 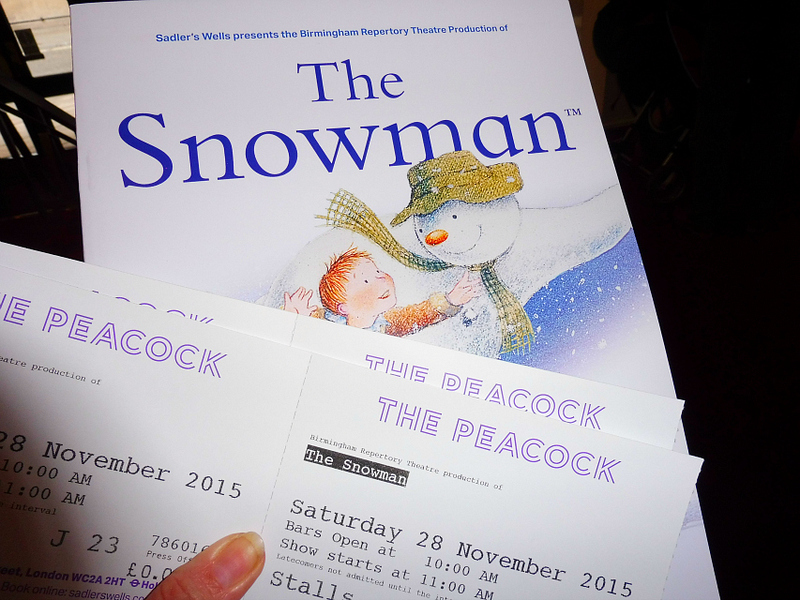 Pure drama, dance, hijinks and comedy ensue when The Snowman pulls the cat's tail! Just as it would if you pulled one in real life! I love the musical score for this scene. The boy then lights up the Christmas tree for The Snowman, which can't help but make you feel festive, if you are not already. As they delightedly flick through TV channels like a pair of best friends, the Snowman starts to get too warm - oooops. One of the special aspects of the Snowman is how even the simplest of things can become a "show". They boy and the Snowman go to the kitchen to "chill out" and whilst there it becomes a dance discotheque simply turning the light on and off again and again and again which is hilarious. It's the Snowman doing this but we all know our kids go through that phase where they also play with lights (whilst they get away with it). After their lil dance, Aaron got such a kick out of the Snowman trying on lots of different noses from the fruit bowl, the funniest one by far being the banana. A lifesize banana, pineapple and coconut jump out of the fridge like the door of the fridge is a stage door to a further world of magic. Think Lion the Witch and the Wardrobe, which becomes The Snowman, the Boy and the Fridge. They spend ages limbo dancing under a broom, but their dance is so fun, that the kids were enthralled rather than bored. My son and youngest niece ADORED the fruit dancing. I know Ruth's kids did too (and he little girl, two years in a row). I've linked to Ruth's review of the show there, so you can see we ALL enjoyed it. Ah after nearly waking the parents they go to the boy's playroom, where they bring a wind-up ballerina to life. This obviously made an impression on Aaron as he's been talking about ballet and ballerinas since the show. A tin toy soldier joins them in the dance. Aaron adored the model train that whizzed across the stage. The cutest thing ever was when a teddy bear came alive and danced on stage too. The first half of the show continues to be fast-paced and action-packed, and continues on in this part two video, which actually includes some of the first half, given that the interval only comes after "We're Walking in The Air". The boy and The Snowman go off in a motorbike with sidecar. 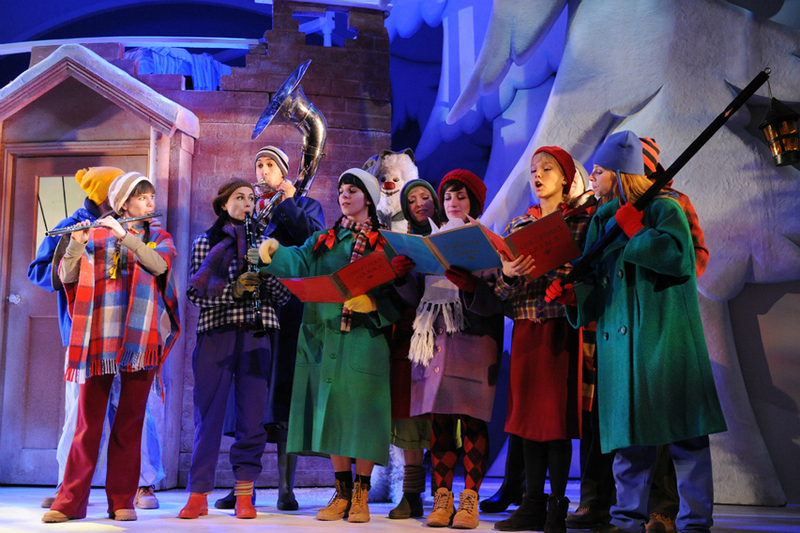 It is a delight and a joy to see it whizzing round, on and off the stage with them really in it and the Snowman driving. Some forest animals join them on stage, and their costumes are so beautiful they make you think of Beatrix Potter. We have a moment of alarm then, as the engine has heated the Snowman's legs and he is starting to drip. They go to the garage where the boy has the great idea of the Snowman hopping into the chest freezer. It works! Renewed from his chill in the deep freeze and inspired by the boy's toy planes, the Snowman and the boy take to the skies, as we finally hear We're Walking in The Air. The way they quite literally walk in the air is magical and really adds to this timeless successful piece of magical music. It's a joy to know our children may be hearing it for the first time, and actually getting as much enjoyment from their eyes as from their ears. I think hearing that song will forever bring back great memories for a lifetime now. The Snowman got the idea to go, from fish fingers in the chest freezer and as they wave at us as the curtain comes down for the interval, we know, from the penguins on stage that they are nearing or at their destination. Being that we had press tickets, we were now treated to hot chocolate in the interval, which went down a treat. The Bar at the Peacock Theatre is great, the prices are reasonable and the selection on offer is good. You can pre-order your interval refreshments and they'll be ready for you so you do not need to queue, which with the attention span of kids is a good thing to bear in mind. While I am talking logistics there is a buggy park, but it is down in the stalls area. Yes there is a lift to get there, but it is small, so either bring a lightweight stroller, have someone who can carry it on the stairs or perhaps baby wear with a sling. I saw a LOT of buggies but people seemed to manage fine. As you can see in my 2nd pic above there are even a handful of stairs as you enter the theatre, before getting to the ticket desk. We came into the second half, after the interval, expecting a similar show to what we'd enjoyed earlier, but be prepared it is an entirely different show, which I hadn't at all expected. Gone is the quaint quality of the family home and gone are the tender moments between boy and Snowman, boy and parents. We're now in a magical kingdom - is it the Northpole??? We're entertained with what feels like chorus line after chorus line after chorus line. Not to worry though as the kids loved it, but it was like we'd gone from a tender theatrical dance show (first half) to a full on Christmas musical (second half), so it is good they punctuate the interval with part one ending on a high with We're Walking in The Air as the second half really is a different show, in my eyes. What do I know? The kids adored it and it didn't bother them in the slightest and I was there for them not me. It's actually amazing what kids notice that we don't. When I made a video of Aaron talking about his favourite bits, he mentioned Jack Frost's shadow appearing on the moon, and I have only noticed that literally just now, today, by watching the video. On the day I was calling that character Frost Bite (LOL) as the name Jack Frost had escaped me totally. What's really cute now, is that Snowmen from all over the world appear on stage, including a Chinese Snowman, a Cowboy snowmen, an Arabic Snowman, a Snowwoman in a pinafore, a very British Snowman in top hat and tails, and a Scottish Snowwoman in a kilt. They are joined by an ice princess. The kids are thrilled now, as Santa his very self makes an appearance! Ah the video now has reminded me of the Dance of the Snowman that Santa initiated. Such melodic music the audience clapped the whole way through - I was thrilled to see Aaron clapping with eyes as big as saucers. The current boy, as I said above, is way more charming than the reviews I have read of others (including the one in this video - Sssshhhhh), although that may just be my loyalty as an audience member but he was superb! The Snowman goes onto have a one on one dance with the Ice Princess which is really romantic - a "pad a deux" just for the two of them. 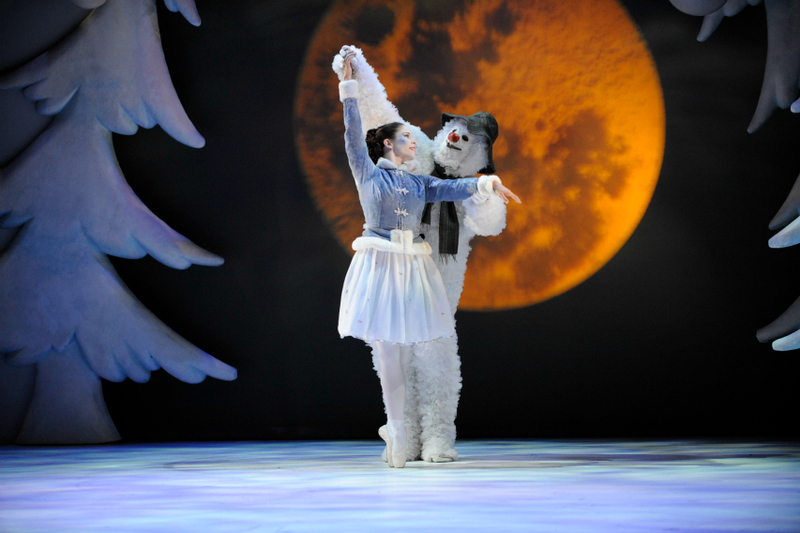 The Snowman really is as much a dance show as it is a festive show for children. His snow costume does not stop him from making a fluid beautiful performace. 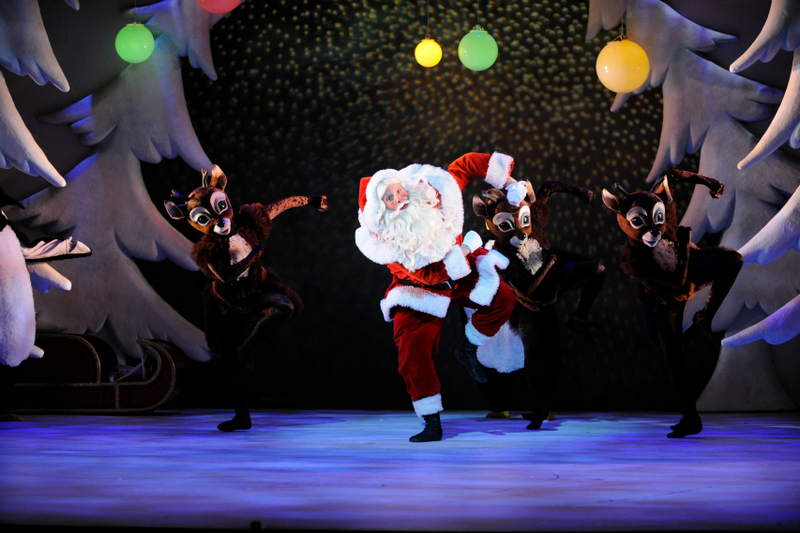 Now we're on this much of a HIGH and Santa is dancing, clearly this is time, as with every good show, for the bad guy to appear, so dramatically Jack Frost appears on stage, at first as a shadow bringing a snow STORM with him. If you are a fan of Strictly Come Dancing you will adore the fact that Jack Frost and the Ice Princess go on to dance a very moody TANGO!!! with the Snowman of course repeatedly coming to her rescue. I know Christmas is the season of the nutcracker, but wow, the Scottish Snowwoman literally nuts (head butts) Jack Frost. 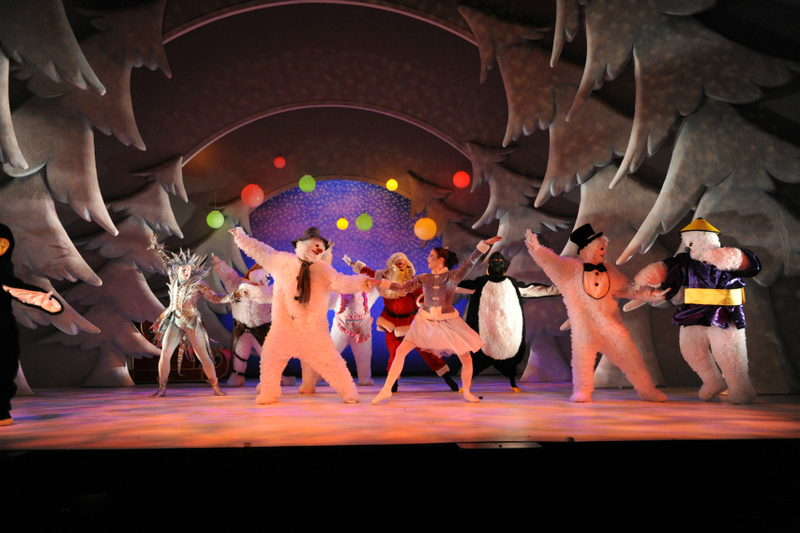 Then the whole chorus line of snow people break into couples including the Snowman and Ice Princess and do a fun Tango. After all that drama Santa reappears with his welcomed sleigh and gifts each and everyone a great shiny wrapped present. Santa doesn't have a wrapped gift for the boy but pulls out of his pocket a blue and white scarf, which you can tell means way more, a beautiful souvenir of their icy adventure. It's simply wonderful when they walk in the air yet again, to get home. Truly magical. They've had ALL those adventures and yet there is still time for the boy to go back to bed when he returns, where he dreams of all he has seen. When he wakes only to discover the sun shining outside and the Snowman now a heap of clothes and melted snow, we are stopped from crying from his excitement at finding the scarf in his dressing gown pocket, the gift from Santa that confirms it was not all a dream after all which thrills the boy. The full cast then come on stage and dance in an upbeat way for ages, which means there is no heavy heart at the puddle Snowman as this is now long forgotten and the mood is lifted. Besides he is fully alive and dancing in the chorus on stage taking his curtain call :-) The overseas snowmen are once again hilarious. The audience get to clap along again and as with the whole show, we are totally enamoured, engaged and enthralled. The music, the costumes, the acting, the dancing, the set design, everything to a very high West End standard. No wonder it is in its 18th year! We received press tickets for the show and every word above is my own. This is a totally honest review. I saw the show with a 5, 7 and 11 year old and they were all equally thrilled by the show. It's a show for all ages and I think us adults had just as much fun. Worth the price to make your Christmas. Who needs Panto anyway - this is far more fun and festive.